Françoise Baylis explains “On Human Gene Editing: International Summit Statement” to the participants at the American Association for the Advancement of Science 2016 Annual Meeting. 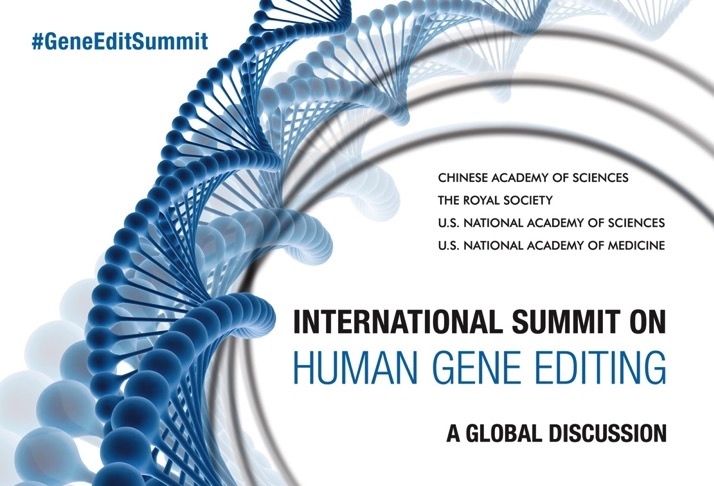 Last December, at the end of the three day International Summit on Human Gene Editing in Washington D.C., the Organizing Committee issued a closing Statement. This statement included four discrete conclusions. As the science and politics continue to evolve, a quick refresher is in order. First, the Committee formally endorsed basic and preclinical research on any and all human cells, provided this was done in accordance with “appropriate legal and ethical rules and oversight.” This would include lab research on somatic cells (i.e., body cells whose genomes are not transmitted to subsequent generations) as well as research on eggs, sperm and human embryos (i.e., germ cells whose genomes are transmitted to subsequent generations if they are used in reproduction). This conclusion demonstrated approval for past and forthcoming gene editing research involving human embryos. Accordingly, the experiment involving the editing of human embryos published in April 2015 by a group of Chinese scientists would be considered “legitimate.” This is not a comment on the ethics or the science of the research. This is merely to say that the research in non-viable human embryos using CRISPR-Cas9 technology to “repair” the HBB gene that can cause beta-thalassemia was done in accordance with applicable rules in China (and, for that matter, applicable rules in a number of other countries). Similarly, the research approved in February 2016 by the Human Fertilisation & Embryology Authority in the United Kingdom, to better understand the basic biology of human development, would also be considered “legitimate.” In both cases this is because the embryo “editing” research remains in the lab (i.e., there is no plan to initiate a pregnancy) and as such there is no germline effect. Second, the Committee held that clinical work (research and therapy) in somatic cells could proceed “within existing and evolving regulatory frameworks for gene therapy, and regulators can weigh risks and potential benefits in approving clinical trials and therapies.” Basically, this means business as usual insofar as research to develop CRISPR-mediated gene therapy could proceed in accordance with existing governance and oversight mechanisms for research involving humans. To state the obvious, people are deeply concerned about the prospect of germline gene editing using CRISPR-Cas9 (an efficient and flexible lab technique for altering genes). Why? Because they don’t just imagine germline treatments for serious genetic diseases, they worry about eugenics and they imagine “designer babies.” And, when they imagine “designer babies” they begin to worry about the designers. What traits will they choose to enhance? Some people imagine individual citizens as the designers and they think about the prospective male parent who is of short stature, who knows that certain social advantages come with height, and who wants to “make” his “boys” taller (consistent with social stereotypes about men and women, he is less concerned about the height of any girls he may have). More generally, individual citizens as the designers might imagine enhancing IQ. Some others imagine powerful, elite scientists as the designers and they wonder: Will they want to modify humans to improve our chances of survival on planet Earth, or will the project be to modify humans to ensure survivability on some other planet? Here, questions of access are raised and people worry about the possibility of a bifurcated future with the “gen-rich” and the “naturals.” Still others imagine governments as the designers. They most frequently worry that citizens (especially the vulnerable among us) will be further oppressed. Now, the temptation for some will be to push these ethical, social, and political concerns aside, but that would be unwise. Why? Because if we are going to control our evolution (which some seem intent on doing), then we need to discuss possible directions and necessary limits. I say this from the perspective on one who believes in the inevitability of genetic enhancement technologies and who understands that CRISPR-Cas 9 is but one path towards this future. In my view, genetic enhancement technologies are inevitable for a host of reasons having to do with facts about the world in which we live including, capitalism (where the market place is all important), heedless liberalism (where autonomy trumps all other values and regulation is bad), a drive for knowledge (as if it were a value neural commodity), a desire to outperform (ambition to be first), and a fair amount of hubris allowing us to believe that ‘the future is ours for the shaping’. Fourth, the Committee called for an ongoing forum and in this way basically said, “don’t stop the conversation.” More specifically, the Committee called for broadening the range of discussants so as to include not only biomedical scientists, policymakers, regulators, research funders and industry representatives, but also healthcare providers, patients and their families, people with disabilities, ethicists, lawyers, social scientists, faith leaders, public interest advocates, and members of the general public. This “open call” is a very good thing insofar as it creates a shared responsibility to thoughtfully explore possible futures. It is now for each and every one of us to live up to the challenge.